January 1st not only marks the start of a new year, it also marks when Girl Scouts are getting ready to sell cookies! When my daughter participated in Girl Scouts, we needed an easier way to quickly give change when customers purchased multiple quantities of cookies. Since I'm a homeschooling mom, I decided to turn this into an educational opportunity. 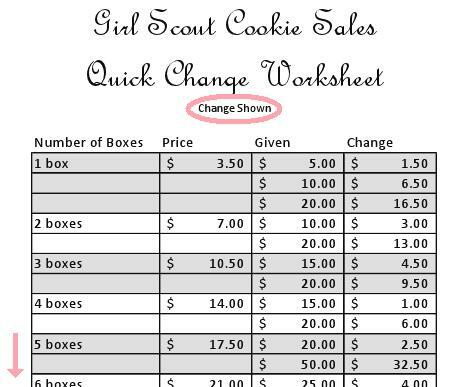 So, I created the Girl Scout Cookie Quick Change Worksheets. 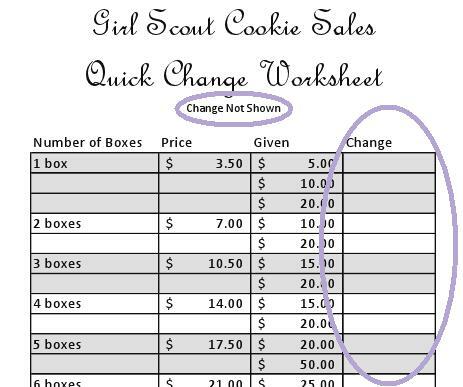 The first column of the worksheet shows purchases of 1 box all the way up to 12 boxes, equaling one case of cookies. The second column shows the price for each box quantity. The third column shows the most common amounts received as payment for each box quantity. For example, if a customer purchases one box of cookies, they are likely to give a five dollar bill, a ten dollar bill, or a twenty dollar bill. Now, here comes the learning part! The fourth and final column shows the amount to give as change for each possible payment option. I created a second version of the worksheet with the "Change" column left blank so that my daughter can calculate how much change to give based on the dollar amounts provided. This helps her understand subtraction, as well as how to count change back to her customers. Selling Girl Scout cookies is the best fundraiser helping local troops pay for awards and activities. It also shows girls how to be responsible with money, how to provide great customer service, and helps them understand basic math. I know there are other moms out there selling cookies, so I am providing this quick change worksheet as a FREE printable. Since there are varying prices across the country, this printable reflects pricing of $3.50 and $4.00 per box, found to be the most common pricing. Click here to view and print your own! 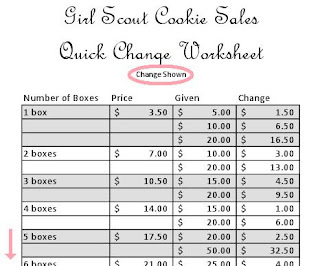 UPDATE 12/31/2014: I have created a newer version of the Girl Scout Cookie Quick Change Worksheet. Due to pricing increases, there are now 4 sheets at the following dollar increments -- 3.50, 4.00, 4.50, 5.00. All 4 sheets show the change amount for up to 10 boxes. Click here to view/print the latest version. Please feel free to share this printable via your favorite social media outlet. I hope you will find it as beneficial as we do! If you are not a mom of a Girl Scout, please show your support by purchasing cookies from your local Girl Scout troop from February to March every year. Thank so much, this will really come in handy! Awesome! Glad you can use it. Thanks for stopping by!